• Summary: Would create definition for acceptable food, water and shelter, requires repeat violators to be charged with felony penalties, allows psychological evaluations of animal abusers at their own expense. • Summary: The group seeks a state ban on tethering dogs that would have exemptions for temporary tie-ups while the dog is in the presence of the owner as well as hunting, camping, herding and transport. • Summary: Subject to approval by Arizona voters, would establish hunting and fishing as constitutional rights and give the Legislature exclusive authority over wildlife issues. • Sponsors: Rep. Bob Thorpe, R-Flagstaff. • Status: Yet to be assigned to committee. • Summary: Would remove livestock and poultry from the current animal cruelty code and place them in a separate category. These two dogs, Spencer and Blanca, once spent their lives on the ends of chains, exposed to the elements and deprived of human interaction, water and medical attention. On Wednesday, rescued and now thriving, they were outside the State Capitol as animal rights advocates called for a law against tethering dogs and other companion animals. Amanda Schlichting, the group’s state director, said Spencer and Blanca’s stories are all too common in Arizona. “As a former police officer, I can tell you I saw this day in and day out: dogs on chains in 115 degrees with no access to water,” she said. Schlichting said her group has teamed up with Rep. Jay Lawrence, R-Scottsdale, to introduce a bill that would establish a statewide ban on tethering dogs. The bill hadn’t yet been introduced as of Wednesday, but she said she expected to see it soon. “It’s going to create a minimum standard for dogs who are living outside,” Schlichting said. Tom Krepitch, district leader volunteer for the group, said dogs on chains usually develop behavioral problems and are more likely to bite people. “It’s really not the dog, it’s the person treating them that way,” he said. But Krepitch said Spencer and Blanca’ friendliness shows dogs can recover from harsh treatment. He said they demonstrate what a difference people can make by rescuing just one dog. “Hopefully those dogs will inspire everyone who comes here today,” Krepitch said. According to the American Veterinary Medical Association, 25 states and the District of Columbia have laws that prohibit tethering dogs unless a human is holding the other end. The Humane Society of the United States is also pushing for support of a bill by Sen. John Kavanagh, R-Fountain Hills that would tighten language concerning animal cruelty, require repeat violators to be charged with felony penalties and offer opportunities for psychological evaluations of animal abusers at their own expense. Schlichting said the SB 1265 would strengthen existing cruelty codes. “We have really good laws in Arizona for animal cruelty. But, like anything else, there’s always room for improvement,” she said. Dozens turned out for the event. Schlichting said the turnout shows that Arizona is filled with animal lovers. “We’re here to be a strong, unified voice and let them know that animal legislation and animal protection is really important to all of us,” she said. The Humane Society of the United States brought two rescued dogs to the State Capitol to press its case for a law against tethering dogs to trees, posts and other objects. Cronkite News Reports. 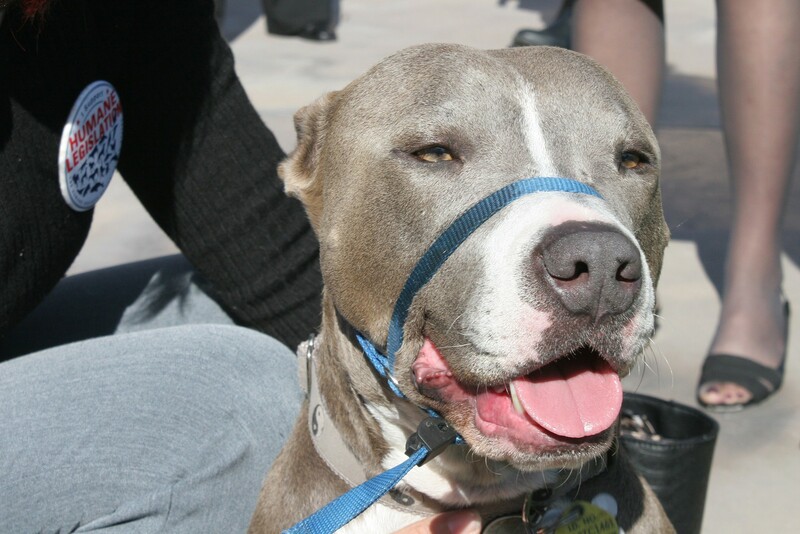 Organizers of Humane Lobby Day at the Arizona State Capitol brought Spencer to bolster their case for a state law against tethering dogs with chains and ropes. They say Spencer spent more than a year tethered to a tree by a 4-foot chain before a a neighbor rescued the dog.